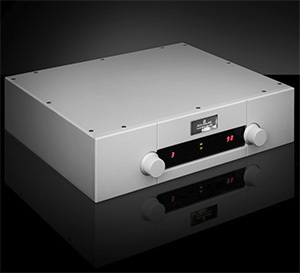 A 300wpc integrated amplifier? "Class D" you shrug off. "One more ICEpower job, perhaps nCore. Yawn. Next." Hola, hombre. Steady. Whilst at 215/280wpc into 8/4Ω more powerful than the Job INT we took a look at earlier, the new Goldmund Telos 590 NextGen is still a wide-bandwidth DC-coupled class AB design. Aside from five analog inputs, there's a new DAC with 24/384PCM/DSD128 USB, coax and Toslink; plus remote control via wand or app for iPad/iPhone. That makes it more potent too than the outgoing Telos 390 which it replaces at right; and which it does a +1 for inputs on. But first, back to the beginning; or end as it were. What about that NextGen suffix? Goldmund had tasked themselves to update their most powerful amplifier ever: the hulking limited-edition 651lbs 1-metre Telos 5000. As the press release explains, the resultant Telos 5500 exceeded their own expectations. Now the decision was made to migrate the same tech over to their best-selling other models both in their preamp and power amp portfolios. Thus the Telos 1000 became the Telos 1000 NextGen, the Telos 2500 and Mimesis 22 the equivalent NextGens. Rather than carry on the previous name with just the new suffix, the numbering of the integrated grew to reflect its power increase. It also grew in physical stature. Then it added visible heat sinks. Of course the gold-plated decal remains. With gold in the company name, some actual aurum belongs. Goldmund are a self-declared luxury house after all. The Telos range is their finest, named after the Greek τέλος for goal. As the final tier above the Metis range, it renders this their statement integrated; their Gryphon Diablo 300; their take on the world's best. Le patron. So bring on the sparkle. Peel off that protective blue skin over the 24-carat plaque. Serve some bubbly. A votre santé! 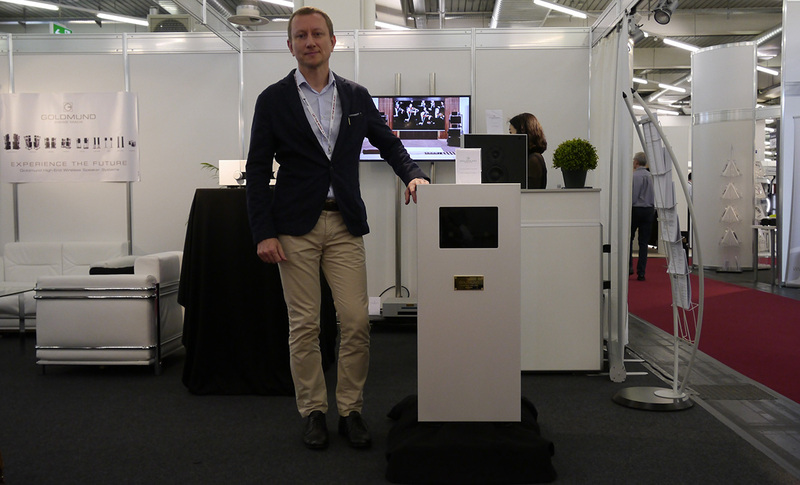 Goldmund at Munich Highend 2017. Their Rodolphe Boulanger next to a Telos 5500 for size reference. Being from Geneva—thus at the very heart of the Swiss watch industry's infrastructure of precision subcontractors—the 590's metal work goes all the way to the extra-smooth silky finish. Though powerful, playing to white-cross conservatism on the hood means sleek understated cosmetics. For hidden machismo under the hood, we'll look at the innards on the next page. Whilst the Job INT digitized its analog input to apply digital volume control, the 590's positioning and plethora of analog inputs called for analog volume, hence no DSP-based attenuation or Leonardo 2 time-based correction logarithm. Relative to my other questions, Anne-Karine Agius, Goldmund's global marketing manager in Monaco, explained that they don't calculate 2Ω power, output impedance or slew rate. In general, Goldmund don't go for a full tech breakdown. They prefer compelling dealer demos to make their case instead. In core markets like South Korea, West Palm Beach and NYC for example, Goldmund in fact run their very own stores. 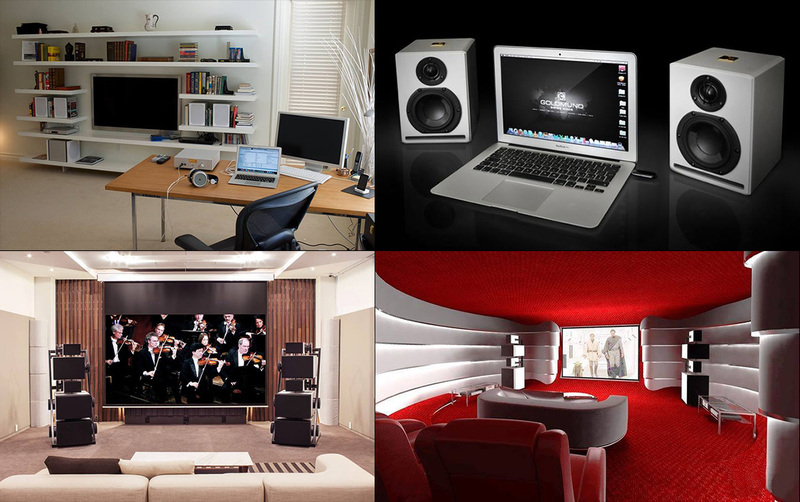 With fully active speakers, in-wall solutions and surround sound, they can demonstrate ambitious home theatre, traditional large-room hifi in stereo, WiFi setups, petite desk-top systems and headfi. Servicing mail-order clients is reserved exclusively for their entry-level Job Electronics brand. 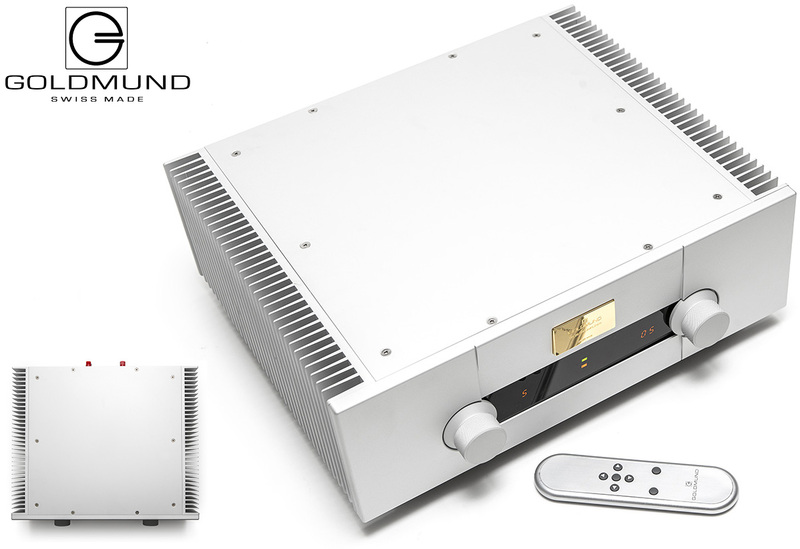 Returning to the Telos 590 NextGen, to drive your own even inefficient passive speakers in a power-hungry large space, one component is all it takes now to harness Goldmund's very latest NextGen gain tech. With an enviable 40 years of R&D preceding it, one expects something very refined; like <0.08% THD+N at 30Vrms out; <0.02% unloaded IMD before clipping; <10µV noise at full bandwidth; dynamic range >100dB. That brute low-impedance power isn't the game we already knew from the 4Ω figure's mere 30% increase over 8Ω and no 2Ω figure. This is not a Krellian power-doubling beast though max consumption is 750 watts. At 35dB, gain is higher than the industry-standard 26dB but then this is an integrated, not just power amplifier. Goldmund's presentation on how bandwidth relates to speed as illustrated with consecutively superior square-wave performance.